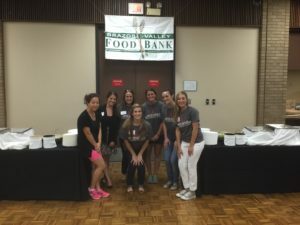 The Brazos Valley Food Bank seeks to eliminate hunger by the distribution of food and grocery products through a network of nonprofit organizations while providing education and community awareness on issues of hunger. In 2007, we celebrated our 25th Anniversary. To mark this occasion, the Future Impact Gift (FIG) was created. Several agencies submitted proposals requesting funding for a large financial gift with a volunteer component that might better the lives of children and youth in the community. After a quite extensive review process, the Brazos Valley Food Bank was awarded the gift and was to receive a minimum of $100,000 up to $250,000 to retire the debt on its new facility over 5 years. 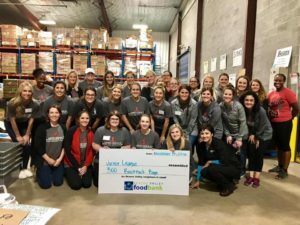 In appreciation the Brazos Valley Food Bank renamed its food distribution facility The Junior League Center. A check was presented to the Brazos Valley Food Bank by JLBCS in May 2007 for a total of $200,000. 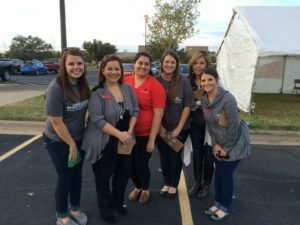 In addition, the Junior League continues to provide volunteer assistance by assisting with the Feast of Caring and the Annual Food for Families Food Drive.